The Arizona Department of Environmental Quality (ADEQ) will be holding a public meeting on Thursday, December 1st to take public comment on the draft amendment to the APP for the Johnson Camp Mine. The meeting will begin at 5:30 and will be held in Benson at the Benson City Council Chamber, 120 W. 6th St., Benson AZ 85602, from 5:30 p.m. to 7:00 PM. Nord Resources Cooperation, the current owner of the mine, will be giving a presentation before the meeting at the same location (the Benson City Council Chamber) starting at 5:00. Please attend the meeting and make oral comments on the permit. Stand up for the Santa Ritas. Say no to Augusta Resources proposed mine. 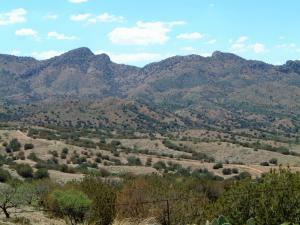 At the first public hearing for its proposed open-pit copper mine in the Santa Rita Mountains, we were outgunned. Rosemont Valley Augusta again bussed in supporters for the hearing after feeding them lunch and opponents of the proposed mine were few and far between. It was a disappointment, but not a shock: The Coronado National Forest let Rosemont Copper's PR firm handle the arrangements for the public meetings. We need you to turn out for this Saturday's hearing and tell the Forest Service what you think of this incredibly damaging proposal, which would pollute our air and water and drive several species in our beloved Sky Islands closer to extinction. 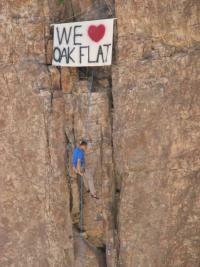 Today the US House of Representatives passed HR 1904, the Oak Flat Land Exchange with a 235 – 186 vote. 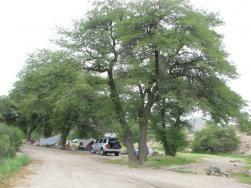 The House also voted several amendments to the bill that w Oak Flat Campgroundere offered by Representatives, Grijalva, (D-AZ), Markey (D-MA), and Lujan (D-NM). This is the first time the land exchange bill has made it through the House in the 6 years it has been introduced. The bill has never made it through the Senate and the House version of the bill is so bad, it will have tough going in the Senate. The bill continues to face opposition from both the Forest Service and the Department of Interior. While the vote is disappointing, it was hardly unexpected given the anti-environmental make up of the House. Still, it was rewarding to see a great deal of pressure put on the House from all walks of life opposing the Oak Flat land exchange. The House Natural Resource Committee will be voting tomorrow, Wednesday, July 13th, on H.R, 1904, the Oak Flat land exchange bill. Please call Members of the House Natural Resources Commitee today! This bill is not only an unnecessary piece of special interest legislation that would severely impact precious water, natural resources, and religious freedom, but also would abrogate our nation’s environmental laws and short-circuit the normal process for approving mines on public land. For more information about the bill see our fact sheet and for additional information see our written testimony submitted to the Natural Resources Committee about the bill. On Friday afternoon, May 13th (yes on Friday the 13th), Representative Gosar (R-1st District) of Arizona, introduced H.R. 1904, his new version of the Oak Flat land exchange. Although he and his staff took the time to meet with Native American Tribes and with opposition groups, his new bill is actually worse than the final version of S. 409 in the last Congress. As a result, we must stop this bill from becoming law. great outdoor environment that is “OAK FLAT”. Secretary of the Interior Salazar is contemplating the withdrawal of over a million acres of public land around the Grand Canyon from uranium mining. The Bureau of Land Management has just relased a draft Environmental Impact statement shoing the impacts of the withdrawal. 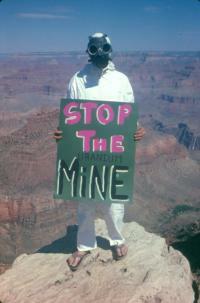 No Uranium Mining Near the Grand Canyon! The impact statement looks at 4 alternatives. One of these, Alternative B, calls for the withdrawal of all 1,010,776 acres. We support this alternative. The Grand Canyon is to important to risk being polluted by uranium mining. The BLM has extended the deadline for comments until May 4. To submit comments, go to the Sierra Club's alert or go to www.protectgrandcanyon.org. See a video to learn why we should protect the Grand Canyon from uranium mining. On April 17th, 2011 from 3:00 to 5:30, come and see a working Sungevity photovoltaic electrical system. 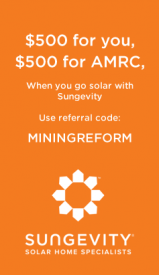 During the open house you will be able to see the system generating electricity, learn more about how you can take advantage of our partnership with Sungevity both to save you money and to financially help the Arizona Mining Reform Coalition, and to learn what the Arizona Mining Reform Coalition is doing in Arizona to help reform bad mining policies. You will also be able to meet our director and some of our steering committee members. Please attend this open house and help us spread the word.